Finding the right way to get people to notice your earring collection. When you’re trying to sell jewelry, you have to find ways to get people to notice them, even when they’re just passing by. 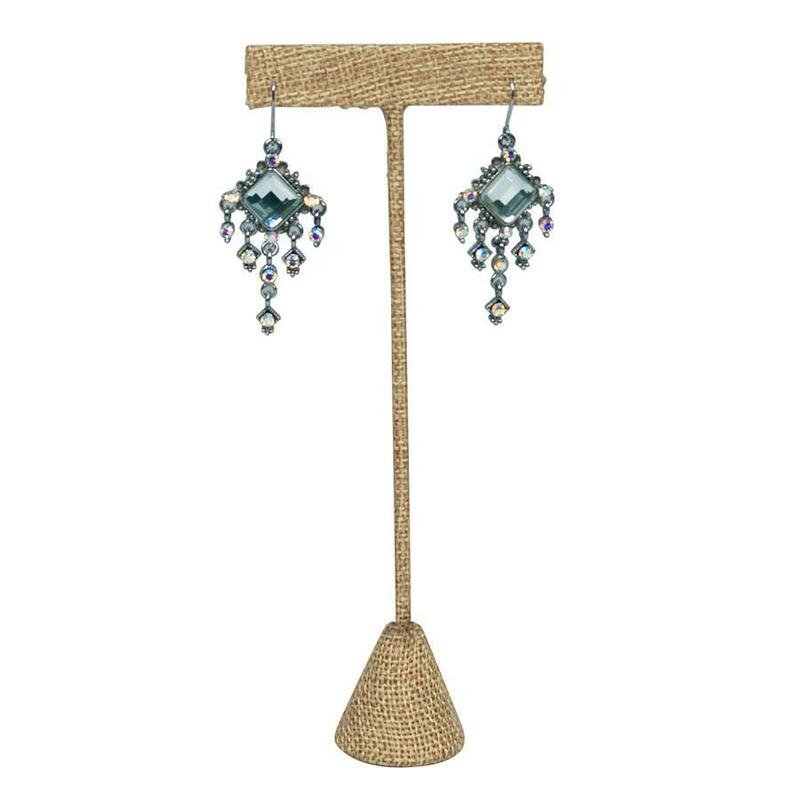 The better the earrings look on a stand, the easier it is to sell them to customers. This is why having an effective jewelry display is essential – to maximize the potential of a piece of jewelry, resulting in more sales. But before you decide what display would be best for your jewelry, you need to know the different types of displays you can have. Once you have an idea of your options, you can start choosing which would work best for your selection. There are several types of jewelry – from anklet, to necklaces, bracelets and earrings. The first type of display we’ll tackle will be for your earrings. Unlike necklaces and bracelets, earrings are similar to rings – small and barely noticeable. This is why you have to find a way to make each pair stand out by choosing the most effective display stand. Here are the different types of stands you can find for earrings. This type of display is for those pairs that you have to display alone. You can use this type of display to showcase the expensive pairs or the earrings with real gems in it. 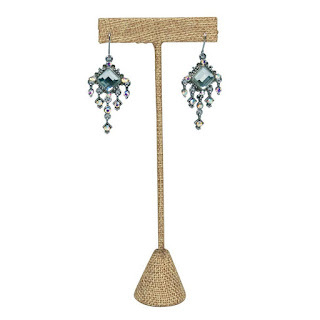 If you also have a pretty set of pearl earrings, they also stand out well with earring display stands. An earring stand is small, but it can stand alone and is slanted just right to show off the design of the earring. A bar stand, on the other hand, is almost set like a tree with many branches, although the traditional bar stand really doesn’t have any fancy design. You can use multiple bar stands to display a set of earrings with similar designs, maybe the same colors. 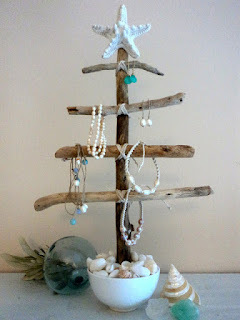 If you’re displaying your jewelry in a color-coordinated fashion, you can use a multiple bar stand to save you space. Unlike an earring stand which can only display one pair, a multiple bar stand can probably be used to hang as much as 10 – 15 pairs. 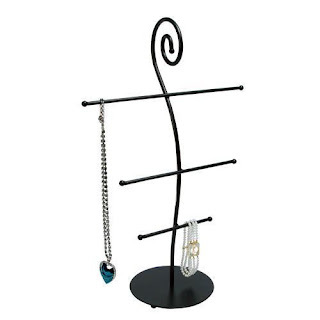 If you have several pairs of earrings to display, then a rotating earring display stand can help you save a lot of space. This kind of display is usually really big so you can display a lot of earrings on it. Customers can easily turn the stand so they can see the other pairs hanging around the back. Unfortunately, you’ll have to constantly turn the display so that everyone has a fair look at the other earrings. Like the earring stand, a hanging earring card can only host one pair. However, it cannot stand on its own. Usually, hanging earrings cards are used to hang earrings onto another bar for displaying. But you can also use these cards to wrap up earrings for a customer. This display can also host only one pair. However, unlike both the earring stand and the hanging card, it displays the earrings horizontally. 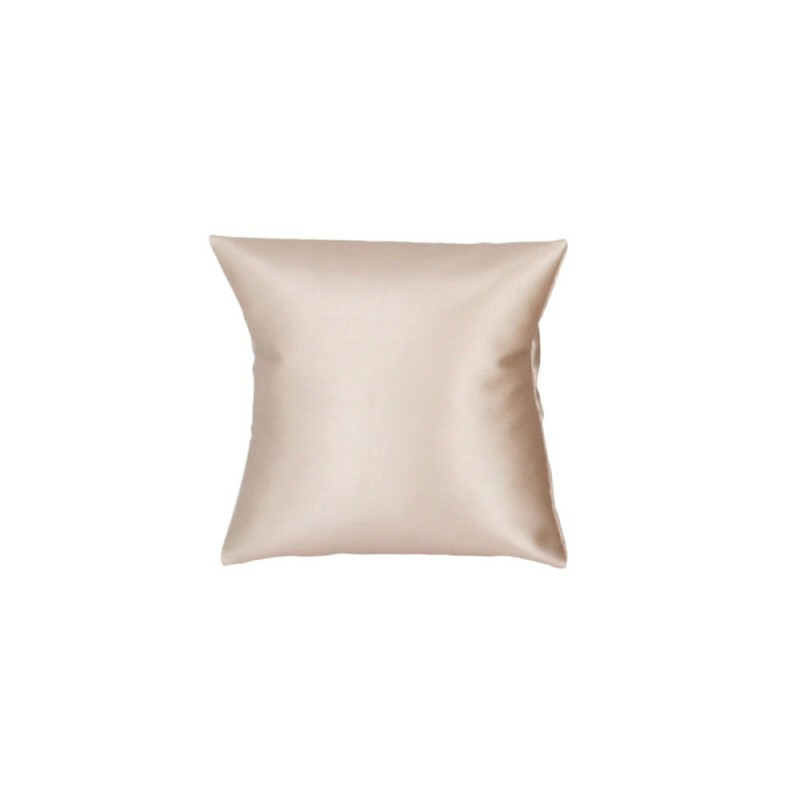 The pair of earrings lies down on a comfortable, puffy (usually white) bed, perfect for helping the pair stand out. These cards also have a hanger if you want to display it on another rack or bar, along with other earrings. When it comes to selling jewelry, finding the most effective display is essential to making a lot of sales. Creativity is one of the characteristics that can truly help a jewelry seller out, even during dead seasons. An effective jewelry display will help customers see their jewelry in a different light. Now, when you’re selling at a jewelry expo or a trading show, you might have to bring a lot of your pieces with you. During these events, many people who love jewelry will be wandering around the area. The more you can offer them, the bigger your sales potential. Unfortunately, a cluttered display can end up giving your shop a negative look. In order to prevent this, it is important to find ways to display your jewelry well, without making it look disorganized. This is why you might need showcase trays to help you effectively display your jewelry. Here are the different types of trays to help you choose which one would work best for your shop. These trays are usually flat in design, but it can still house a lot of jewelry. Available in a variety of designs – whether for necklaces, bracelets, earrings or rings – you can use these to display jewelry beneath a glass window. You can also choose whether you want a vertical design or a horizontal design as these versatile showcase trays are available in both styles. On the other hand, a slanted display tray also offers the same benefits as the versatile showcase tray. You can display several pieces in one tray. However, the slanted display tray has a slightly slanted shape so that your jewelry is set to look up to the customer, giving them a chance to see the pieces in a better light. These are usually recommended for earrings so even if it is displayed within a group, customers can still see the pairs clearly. A curved display tray has a slight curve or slant beneath the surface to increase the height of the jewelry in its middle. This display tray is best for necklace, chains and bracelets, the curved display tray emphasizes the chains where it is most important – the middle part, or the design of the jewelry. Giving a little height to your display can make a difference to how a customer will see the jewelry. Do you have a lot of jewelry to display? Are you worried that it might be hard to pack up after the day is over? If you are, then a stackable display tray can really help your cause. The benefits of this type of display include its capacity to showcase a lot of jewelry and easily stack each tray up for packing safely once the day is over. You won’t even have to handle your jewelry again. Choosing the utility trays to showcase your jewelry can be important. You have to choose which one would work best for your display so that your jewelry doesn’t end up looking like a mess or cluttering your booth. As a jewelry maker and seller, it is important to know a lot of things about jewelry itself. Besides having some ideas about building an affordable jewelry display, creating jewelry from scratch and marketing to customers, you’ll eventually need to know what jewelry findings are. If you create your own pieces, you should know the purpose of findings. But if you've only been selling the jewelry, it might be time to know what findings are for – especially if one of your customer happens to be looking for some. Jewelry findings are a variety of elements used to complete a whole piece. Without the findings, a piece of jewelry may not be closed together to wrap around the wearer’s neck or wrist. These findings are required to ensure that the customers can wear their jewelry without fear of it slipping off or simply falling out of place. If you’re new to creating jewelry, you’ll need this to finish off your pieces. But in order to do that, you also need to know how to choose the findings for your piece. You see, not every piece of jewelry from your necklace display stand has the same type of finding. You have to pick out which one works best for your piece. In order to do that, go through these guidelines to help you choose which findings will complete your jewelry. First things first, the kind of metal is important when you’re looking for findings. If your jewelry is made out of gold, it might not be right to close it with a silver-made finding. Not only will that look out of place, but it will be too obvious for the customer that you cheated them out of one part of the jewelry. The finding should perfectly match the rest of the jewelry and to start it off – it has to be crafted out of the same metal. If your jewelry is made out of sterling silver, choose a finding crafted out of sterling silver. The design is also important when you choose the element to complete your jewelry. If your finding happens to look completely out of place, it will decrease the aesthetic look of the jewelry to customers. Find one that will blend well with the jewelry. If not, make sure the clasp is strong and it will not over-shine the jewelry itself. Colors are pretty essential when it comes to creating jewelry. Without a good set of colors, you take away the chance of a piece of jewelry being bought. This is the same with findings. You need to make sure that the findings will match the rest of the jewelry. Don’t clash colors or it will make your jewelry look bad. Findings should not cost more than the jewelry itself. Make sure you buy these components at a good store with reasonable prices. If you have to, buy extra pieces, just in case something goes wrong while finishing off your jewelry. Some sellers get jewelry makers to create the products for their jewelry store. This way, the only thing they have to worry about is the jewelry display, how to sell and attracting customers. However, there are also some cases where even the seller could also make their own jewelry. In creating jewelry, all you really need is a lot of creativity and inspiration, some skills and a few tools to help you create the perfect pieces to sell. For those who’d like to try their knack at creating beautiful pieces, here are some tools you’ll definitely need when making your own jewelry. Most jewelry is made out of different types of wires and cords. If you’re creating beaded jewelry, you’ll need to choose a specific type of wire or cord to connect the beads to. You may have to use nylon too, if needed. Choosing the type of wire and cord for your jewelry is essential because it will determine the strength of your pieces. If your wire breaks and tarnishes quickly, you might end up with easily broken pieces. If the wire and cord is the foundation of jewelry, beads create the aesthetic effect to your jewelry. There are many different kinds of beads – from colored, to plain, to those that look like shells and even crystals or if you’re more creative and experienced – Swarovski crystals. Choose specific beads for different types of jewelry. Get the right pendants for your necklace. Be wary of the colors you choose. Remember, you’re creating jewelry, not some form of costume. Make sure the colors go well together so that when the customer sees it, they’ll be attracted to it. Sometimes, jewelry doesn’t only have beads and wires. Other times, they will also contain embellishments such as ribbons and yarn to make the jewelry look even better. There are also other types of embellishments like charms, pins, flowers and more. However, make sure not to overload your jewelry with too many embellishments. The more embellishments, the less the purpose of the beads. Too many embellishments will also make the jewelry look cheap. Now that you have everything you need for the jewelry, you need to prepare the tools you’ll need for making the jewelry. You’ll need a set of pliers to arrange the wire and insert the beads, tweezers to handle the beads and crystals carefully and even magnifiers to watch your work carefully. With just the right tools and supplies, you might not need to hire jewelry makers anymore. Nilecorp has a complete supply of everything you might need to create jewelry. 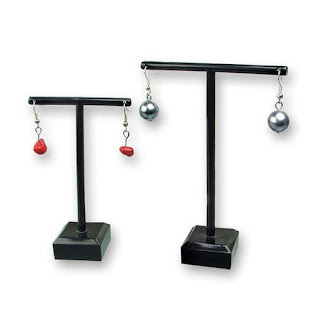 We also have a wide varieties of necklace display stand, earring holders and other jewelry display. Are you at the stage where you need to figure out the type of jewelry display for your store? While most other jewelry store owners settle for plastic trays, towers and handles, you may want to consider using a wooden jewelry display instead. Yes, plastic and acrylic displays are usually cheaper, but without a doubt, these wooden pieces are also very beneficial for store owners who wish to use them. Why? Wooden displays are made to stand for long years of use. Since most displays crafted carefully out of wood are made out of really good material, even if you’ve changed as much jewelry as you can, you’ll still enjoy the same texture and built as you once did when you bought it. Even if you’ve used it through several trading expos, you’ll still be able to display it in your shop. You won’t have to worry about seeing wear out marks that will only get in the way of a successful jewelry display. The good thing about these wooden displays is that it looks good in almost any theme you choose for your display. If you choose to have a “nature” themed display, you’ll be able to put the wooden displays to good use. Since most wooden pieces are made of quality materials, you’ll also notice how sophisticated they’ll look with your jewelry display, no matter the design. You can use the wooden displays even for Christmas or during Thanksgiving when everyone’s looking for gifts. 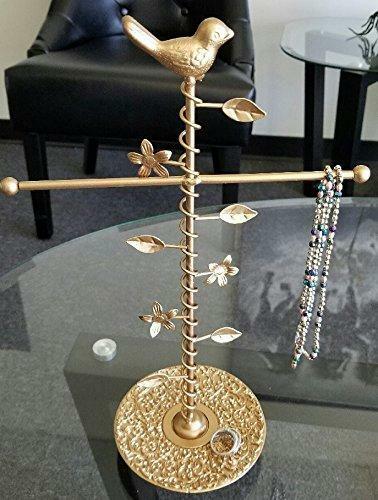 Nilecorp even has beautiful earring display stands that look like the branches of trees. Not only will you get functionality, you’ll also enjoy its elegant designs. Do you know that the buying decision is usually made when the customer sees the jewelry on their own skin? Once they see how they look while wearing the pieces of jewelry and they like it, that’s the time they’ll want to buy the piece. However, once they see the jewelry on wood which has almost the same skin color, they’ll already be able to imagine how it’ll look on their skin. Just by having these display pieces for your jewelry, you can already establish connection between your customer and your jewelry. Unfortunately, there are some wooden jewelry displays that cannot be folded so you may have a hard time packing up your store or booth. However, if these wooden trays can really bring out the best in your jewelry, then what’s stopping you from getting one? When you’re building your own jewelry shop, there are a variety of factors that you need to consider in order to make sure that your shop is ready to go. Besides the actual jewelry to sell, you also have to consider your jewelry display, store decorations and even accessories that will make running a jewelry shop more convenient. Once you have all the important factors down pat, the display and the jewelry, it is now time to make sure that you have the accessories you need. These accessories may not be as important, but you may find use for them when selling jewelry. No jewelry shop or booth should open without a mirror to help their customers check themselves out when trying on the jewelry. If you have no mirrors, customers may find themselves a little discouraged, especially because they can’t really see how they look like. Even jewelry booths must have their own mirror, even just a small one. Stores who wish to make an impression on their customers can put up larger mirrors around the room. Not only will the customers appreciate it, it will also make the room look bigger. Stores are never complete without the right signs to go with it. Before you open up shop, you have to make sure that you get the signs that your store may need. This may include shop signs like Open and Closed, No Smoking, Sale, New Arrival and even Exit. These are pretty standard, but if you want a creative sign, you might want to look at different shops before you buy one. Besides store signs, you’ll also require signs for your jewelry. Authentic gold and silver should be labeled well, so those who are looking for these kinds of pieces will be able to find them quickly in your store. Choose metal signs, instead of plastic, so they won’t end up looking cheap within the authentic jewelry. Although definitely an optional choice, label tags allow you to mark your pieces conveniently. Customers won’t have to keep asking you for the price of a piece because they’ll be able to see it through the glass window. There are easy-to-stick adhesive label tags so you don’t have to worry about pulling it out accidentally. You can also choose to buy string tags, if you think adhesive label tags are too big. At least, you won’t have to stick on the price tag on the jewelry itself. Doing that may end up in the color sticking to the adhesive tape on the price tag. Before you display your jewelry, think of the different tags you may want to stick on them. Sometimes, uniformity will make your necklace display busts look clean, but if you’re creative, you can also choose different tags for different pieces. Remember, accessories help make running a business more convenient. Even if you don’t have these accessories at the time you open your shop, you’ll find yourself eventually looking for some to make your shop look more appealing both to you and your customers. Now that summer is closing and everyone will be back to school soon, there’s a huge chance that your sales will also go down, especially with other people tending to school supplies and requirements. But instead of worrying about your sales and hoping only for the best, there may be a way for you to do just fine during these times. Just like any other store, you have to take advantage of the end of a season. Now that summer’s almost over, it is time to hold up your racks, get on your marketing thinking caps and devise discounts and strategies to mark the end of the season. This is definitely the best time to promote your products through sales and discounts. Many of your summer jewelry should be put on sale, especially now that the season’s almost over. Consider a buy one take one strategy, or if this doesn’t work, set aside some pieces that you can sell for lower prices. Many people save up for the end of the season because this is usually the time when the best pieces of jewelry can be bought at the fraction of its original price. If it’s the end of a season, then it also means that a new season will start soon. Now that summer’s almost over, it’s time for school to start. This means that you can finally put away all of your summer jewelry display and replace it with decorations more appropriate for school. If you had Olympic decorations around your store, it is now time to display jewelry pieces that may be worn at school. Silver and gold pieces make stylish additions to formal uniforms, while those who don’t have uniforms can enjoy a more stylish, fashionable collection from their favorite celebrities. A little tip: everyone likes dressing up well for their first day of school. If you’re creative enough, you can turn your own jewelry store into a school setting, giving customers a chance to see the pieces in a different light. Use darker shades of necklace display stands and towers and bank on wrapping any sold pieces of jewelry in a book-bag style pouch for protection. In order to attract people to your business, it is important to keep up with the latest trends. Despite many businessmen arguing that marketing strategies is enough to get sales, it won’t hurt to use some creativity to add more customers to your list. Now that it’s Olympic season, it may be time to hang up Christmas-season designs and redecorate your store or booth into something more festive for the current trend. So, how do you turn your jewelry display into something resembling the Olympics? The first thing you need to do when changing your jewelry display is to take advantage of the colors of Olympics. These colors are the same as those in the Olympic rings – blue, yellow, black, green and red. Now this should be easy, because these colors are already the basics. But just to make it more obvious, don’t mix up the colors of your jewelry arrangement by random. Instead, arrange your jewelry to match the order of that in the rings. Even if you use colored jewelry display trays and towers, it may not make a lot of emphasis on the Olympics. Instead, you have to highlight each color by using pieces of cloths and fabrics as background. For those who have stores, place lengths of cloths beneath each display item. Have the colors aligned in the specific order of the rings. You can also set up posters of various Olympic athletes around the store. Nothing like gold medalists to get customers into the Olympic spirits. For those with booths, use cloths as background for your jewelry display. If your booth is too small, create a minimalist design in the middle of your booth using the five colors. Cut out rectangular shapes of cloths and align like the rings. Set up a jewelry tower in front of it, but make sure the cloths can still be seen. Every gold medal is attached to a ribbon. Embellish your store with lace and ribbons in the colors of the Olympics. If you’re truly creative, cut out huge circles in gold, silver and bronze colors and hang them on a ribbon at various locations in your store. For booths, create little medals and hang them, along with your mini necklace and pendant display . This will show everyone how it looks to wear a gold medal over a neat piece of jewelry. If you’re patriotic, also add the national flag to your store’s decoration. Olympic-themed stores are not only very attractive these days, but they also give you a sense of pride, especially with the many gold medalists who will come home a changed person after the event. For those who are hoping to start a jewelry shop with an actual physical store or booth, there are several ways for you to get your supplies. While many will want to start with basic materials, those who can invest money for jewelry display will want to buy necklace display trays, earring holders or towers to ensure that their jewelry gets the exposure it needs to sell. However, if you can’t find a cheap supplier nearby, you may want to consider ordering online instead. If there are sellers who can supply you with a wide variety of display items like jewelry towers and ring trays, there are also shops online that will be willing to supply you with the same items. But why should you buy from an online shop? If you truly want to get good prices for your jewelry display cases and trays, you may want to stick to an online supplier instead. Suppliers with a physical warehouse and store have to sell their items at higher prices, due to the fact that they pay for several overhead costs as well. Unlike those who sell from their own homes, they can easily sell quality products at a cheaper price. Besides a cheaper price for each tray, case or tower sold, there’s also a huge possibility that you can get yourself a good discount if you buy in bulk. If you happen to need a large amount of display items and you decide to buy it all at one time, you can talk to the seller to give you a discount that your financial advisor will surely appreciate. There are also some sellers who will offer coupons for specific seasons or occasions. Use these coupons and get yourself a big discount on your next purchase. When you start setting up for your shop or your booth, you’ll need to get your items from your supplier. Just taking the time to go to your supplier is already exhausting and you’ll still have several things to work on. If you choose to purchase from an online supplier, they can do all the shipping and transportation for you. All you have to do is open the door and accept the items. Of course, you need to check the items first though, so you know what you got and you can make sure that the display items you received are correct and in perfect condition. Unfortunately, there are also negative factors to consider when you’re buying online. Since you’re in business, make sure to check first that your supplier online is legit and that everything they sell is of great quality. This way, you don’t risk all of your capital and your business just because of a bad supplier.